RapidClear, for optimal protection in all weather conditions, is the alternative response, easy and fast to traditional paints. 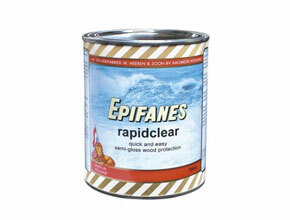 For a long-lasting protection of all internal and external surfaces above the waterline. It adheres very well to teak and other oily woods, preventing discoloration and emphasizing the natural grain of the wood. RapidClear can be used to renew deteriorated surfaces as transparent bottom before a traditional cycle or as a complete cycle where it is required a quick and easy application satin finish with excellent breathable characteristics, flexibility, excellent lasting, resistance to U.V. It is applied by brush, roller or spray in 3-4 coats 5-6 hours apart. None required sanding between coats. If RapidClear is painted over conventional paints, it suggests a sanding with 220 grit dry. Easy to touch up and maintenance.